Paris is Paris. By that I mean you don’t go to Paris to only stick yourself in museums. There are so many things to see and do in this amazing city. Sure there are the standard tourist sights, but there are also a few slightly different things that can still be touristy. Or maybe even offer a different take on something you know from elsewhere. We found things to do in Paris that aren’t museums while on The 2016 European Museum Tour. 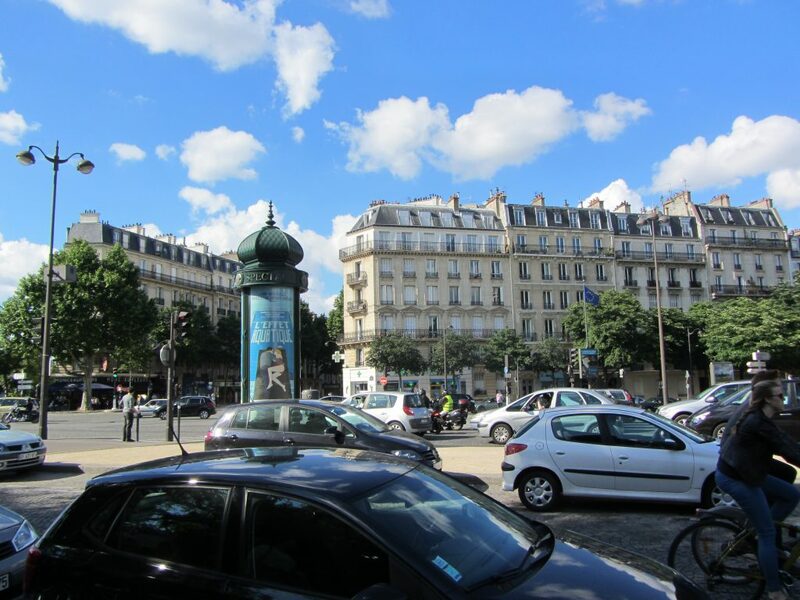 We travelled around Paris and the surrounding area using the Metro trains. Google Maps on our phones was great for directions. We also each had the paper hand-held map or mini map, of the Metro train system. I don’t pretend to understand a lot of French, but these maps allowed us to travel all over, on our own, without any major problems. It won’t help with accidentally getting off at the wrong station or catching the wrong train, but it will help you navigate this very large system. While there are things to do in Paris that aren’t museums, there are some things that are magnificent but technically still considered a museum. 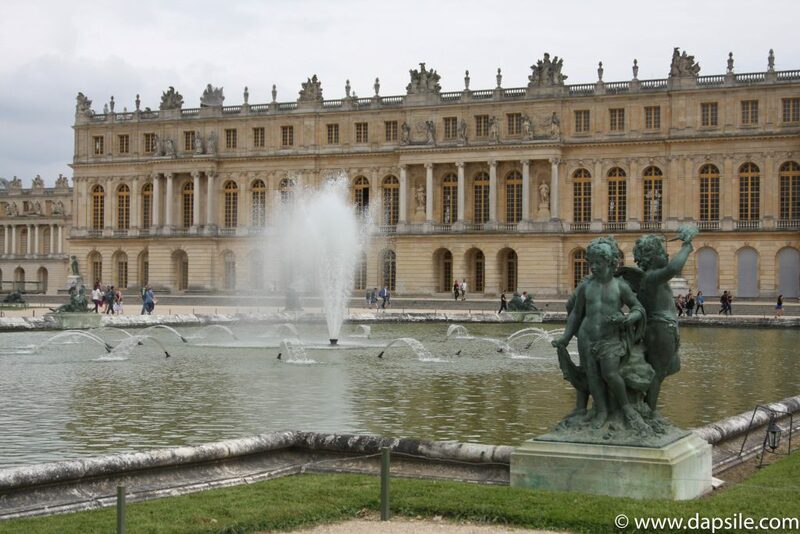 The Palace of Versailles is a former royal chateau in Versailles. It is also a UNESCO site, and one of the most opulent places I have ever seen. Versailles was once a small village but now as one of the suburbs of Paris, it is easily reached with the Metro. I have been to the Palace several times and it is a sight that really shouldn’t be missed. The way the royalty lived in the 18th century is the reason there was a rebellion and both the ruling and the class systems were forever changed in France. 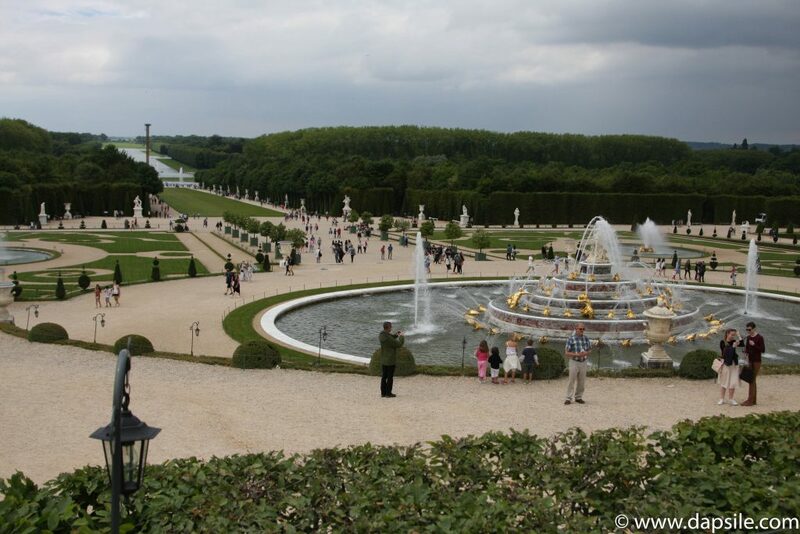 Expanded and altered over time to what you can witness today, Versailles started out as a royal hunting lodge. It is outstanding and I have yet to see another palace like it. Ceilings gilded with gold and painted by some exquisitely talented artists are so high, you feel they reach the sky. 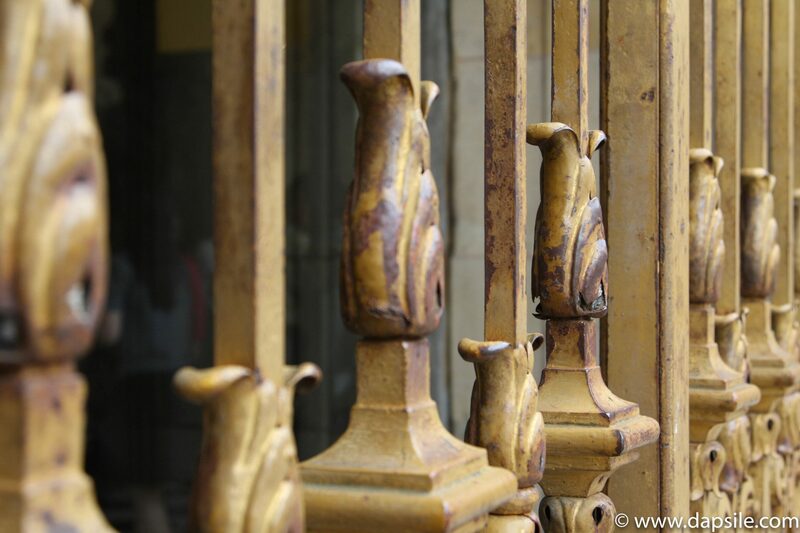 Pretty much what isn’t in gold throughout the palace, is in marble. There are intricate light fixtures and chandeliers with crystal that bounce light in every direction with the help of so many mirrors and windows. The gardens and fountains are also exquisite. Perfectly laid out hedges and trees show paths to water fountains, statues, a canal, lake, park, private areas and individual groves containing beautiful patterns of trees with more fountains and water features. The palace and the grounds are enormous. So large you can rent golf carts up near the palace and bicycles further down in the gardens. 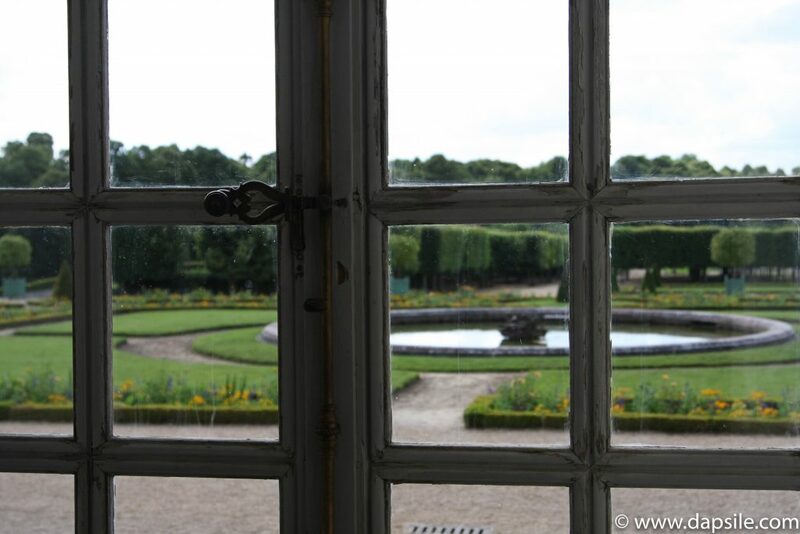 Within the gardens, you will also find the Grand & Petit Trianons. These are smaller and more private locations that some of the different royals lived in. And they are both beautiful. You can plan your trip in advance based on opening days and times as well as if you want to see the fountains running or the musical fountains show. You can also purchase your tickets in advance on-line to save yourself a second line-up. This is another one of those jam-packed tourist sights so expect to stand in line before entering and to share the experience with a lot of people. Seeing all the Disney Parks is on my bucket list. 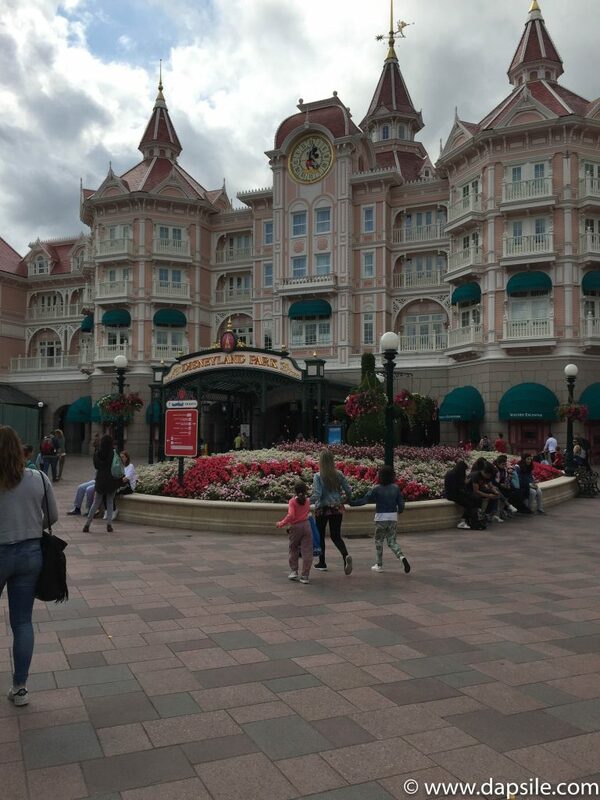 I’ve been to Disneyland in California several times as well as Disney World in Florida so I really wanted to do Disneyland in Paris. Plus it is another of the things to do in Paris that aren’t museums. Once again, we easily accessed it with the metro train but it was a bit of a distance. 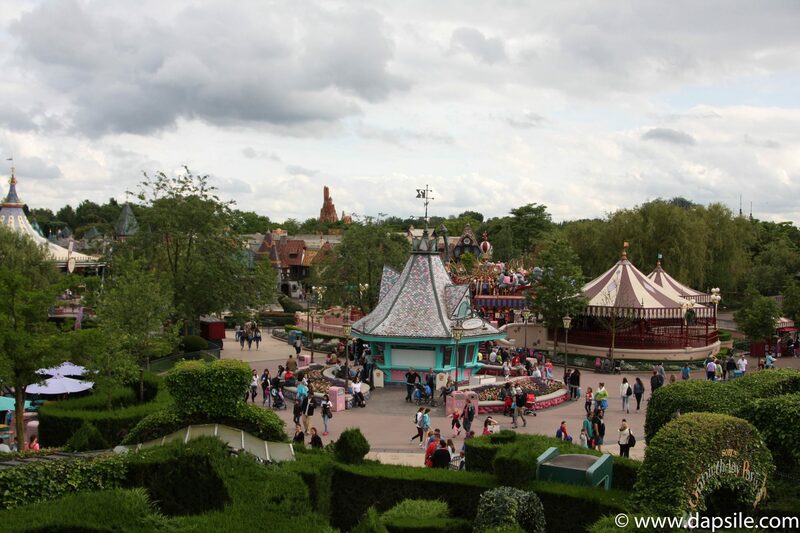 The Disneyland Paris layout is similar to the original California park. 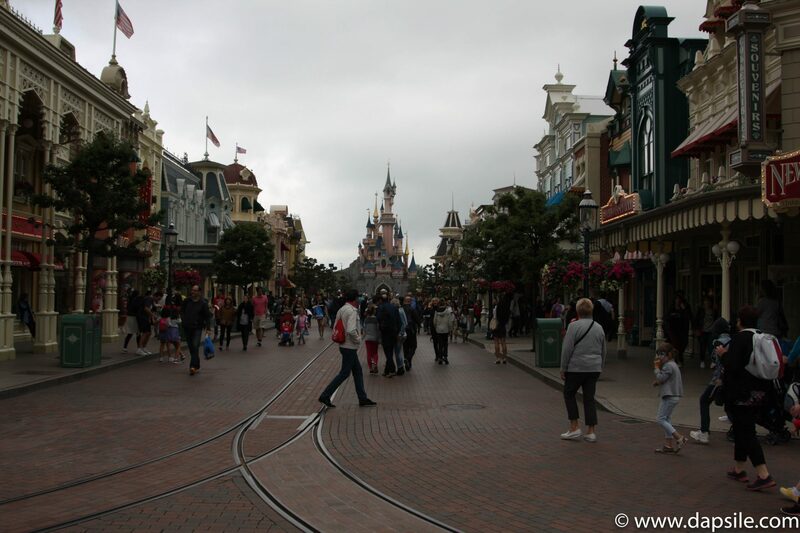 There are the different sections with main street leading you from the entrance to Cinderella’s castle. Disney World in Florida is Sleeping Beauty’s castle. 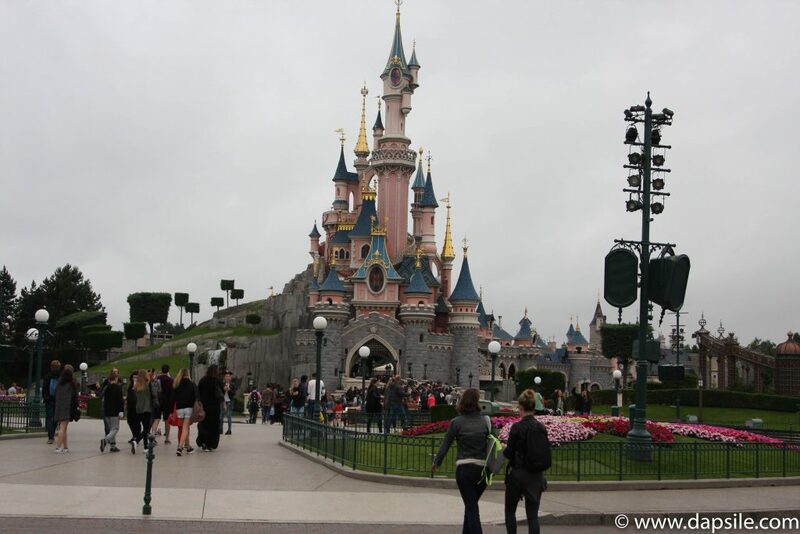 In Paris you will find the main Disneyland Park but also The Walt Disney Studios Park and the Disney Village. 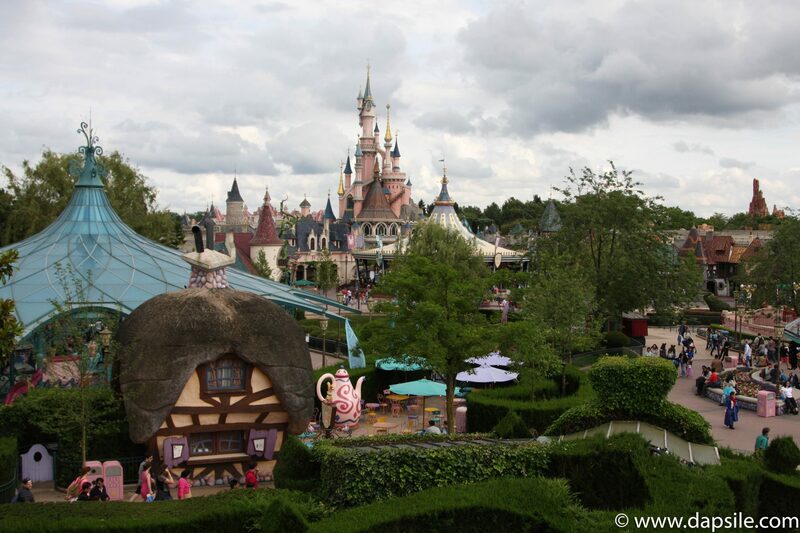 The area is quite a Disney tourist destination though with several different Disney hotels to choose from. 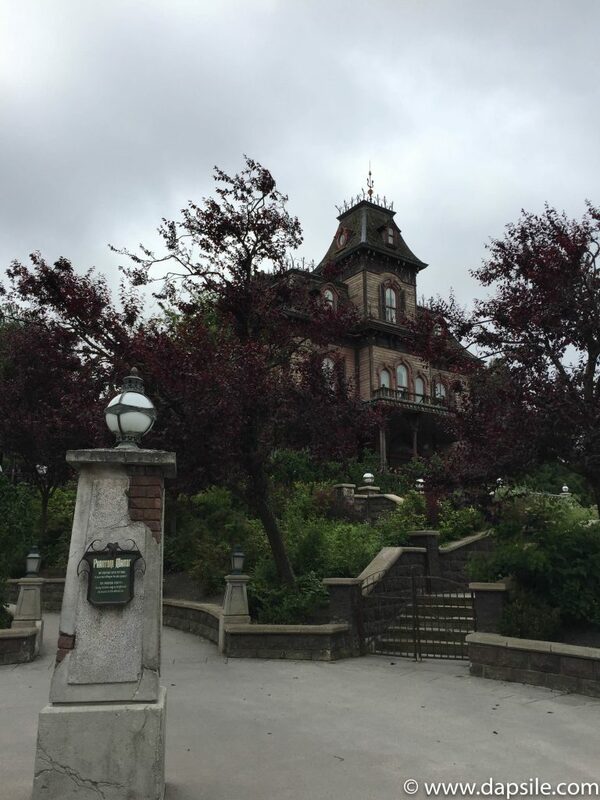 The Disneyland Hotel is even located right at the entrance of the park. 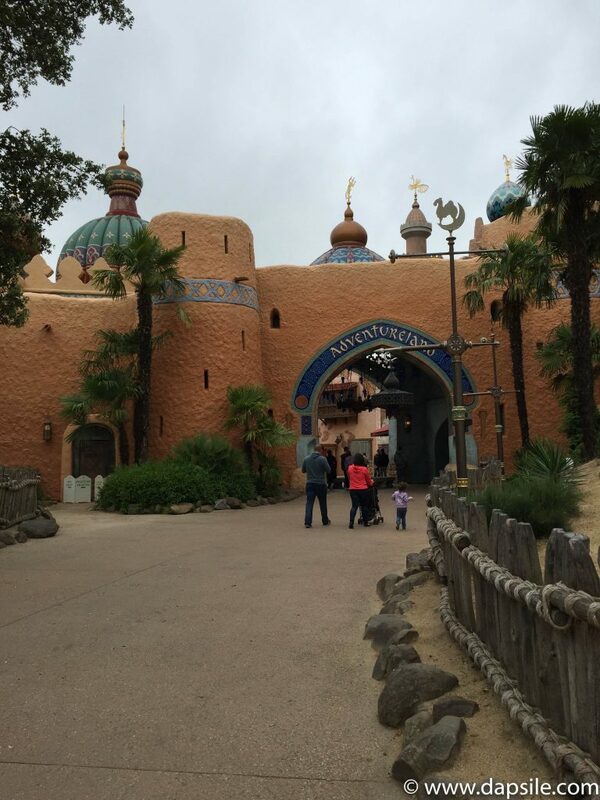 Some of the rides are pretty much the same as in California but some are different. 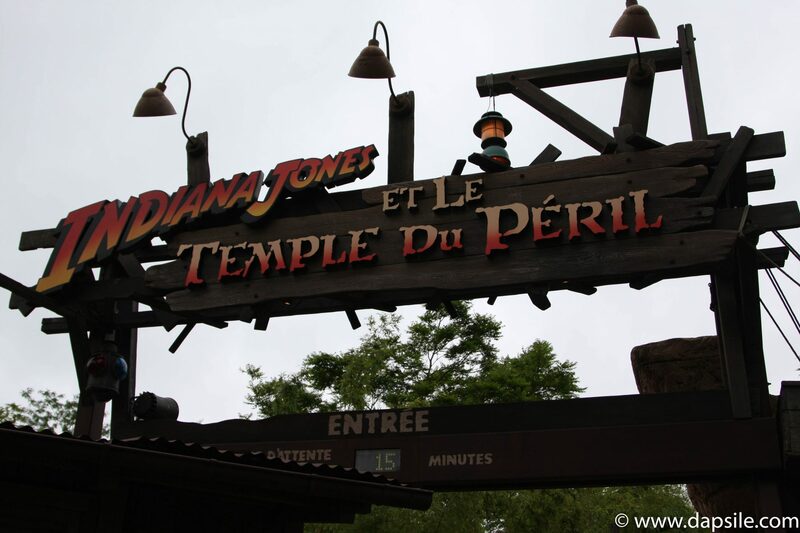 The Indiana Jones ride in California is a large car that moves indoors with some fast sections and a drop or two. In Paris, it is a rollercoaster. According to my cousin Megan, it was freaky and finished quickly. 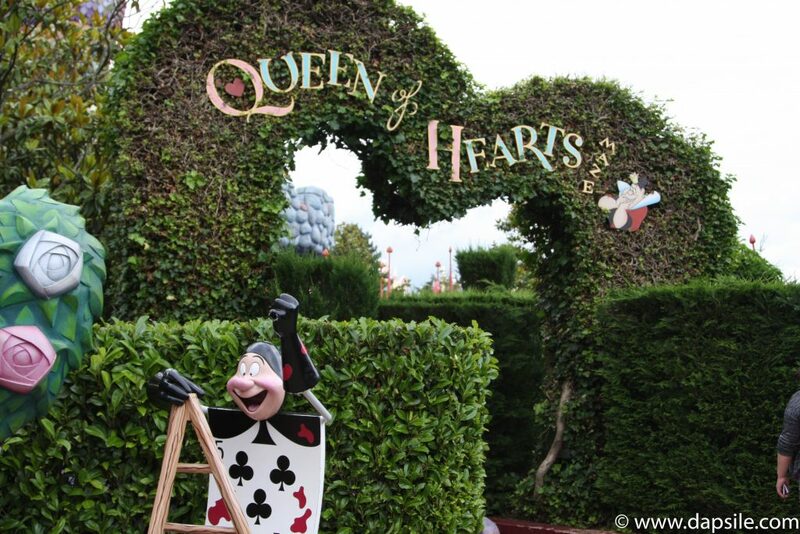 There was one aspect of Disneyland Paris that made it better than all the other parks. While there were line-ups for rides and attractions, there wasn’t the insane amount of people I expected from my experiences in the USA. It had a much calmer feel to it. I wasn’t even hit by an aggressive parent with a stroller once. Let alone repeatedly. Thankfully we did research before we left and bought our tickets in advance on-line. We bought the ‘Special Mini Tickets’ which were only available on-line. They were for use during the week only during certain summer months, but the prices were great. I think they were less than $50 (CND) each for two parks. My cousin Megan wasn’t sure if she really wanted to see certain sights or if it was just because they were the touristy things to do. So, we chose to do something that was kinda touristy but more of an experience rather than a ‘lining up with heaps of other tourists to see a sight’ thing. 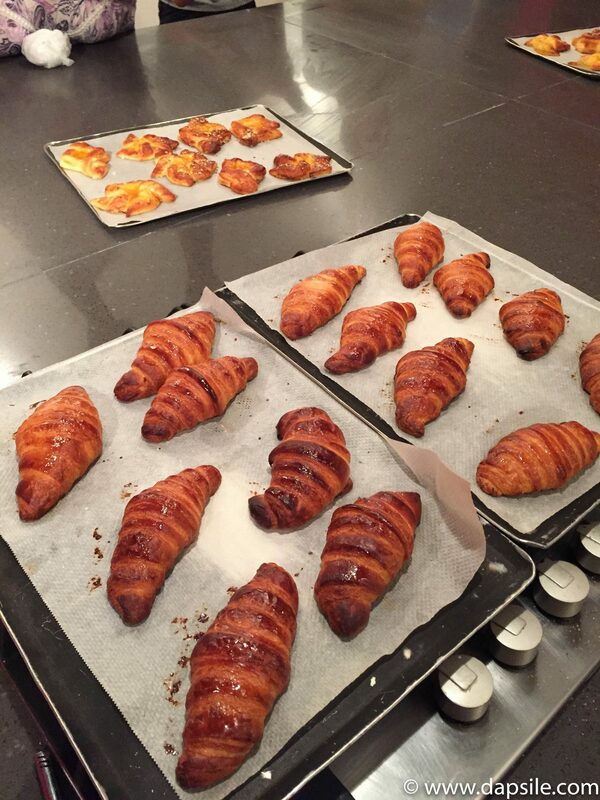 We took a croissant making class with la cuisine Paris. Megan and I both bake so it was perfect, and we loved it. Even though we normally have different styles. She’s very specific and likes to follow the instructions exactly. I like to change things and wing it to create something slightly different. The class was set up so that you could learn without any previous experience though. The 3-hour class was taught in English by a chef, and consisted of other tourists. A husband and wife with their teenage son, a mother and her teenage daughter and a single woman. 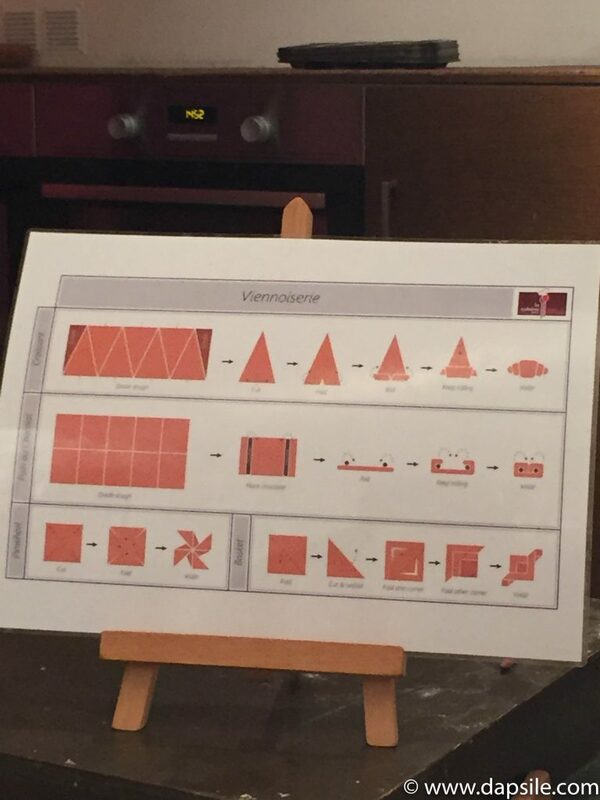 I loved that we were given an instruction sheet to take home with us. It showed us how to create the different shapes for croissants, le pain au chocolats, and le pain au raisins. Everything you need was supplied in the class. 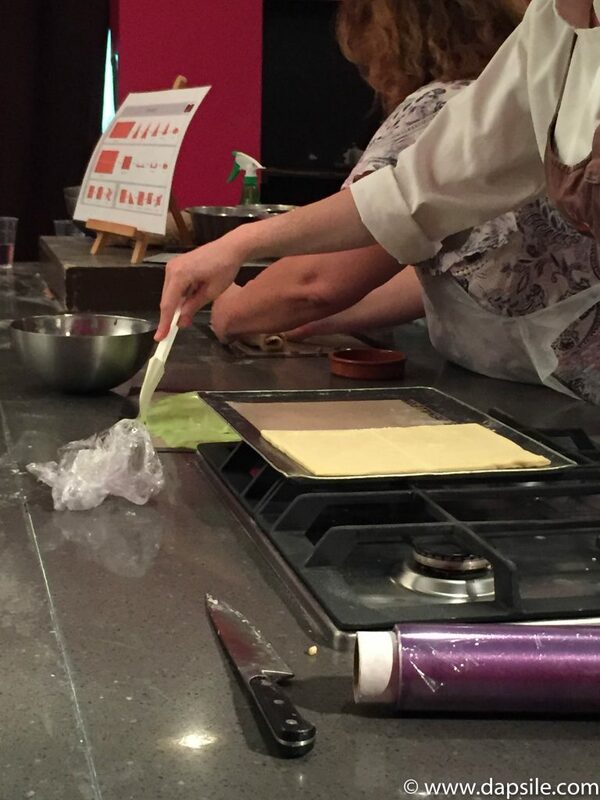 Including after you make the dough, being given a different one to use for the final product. 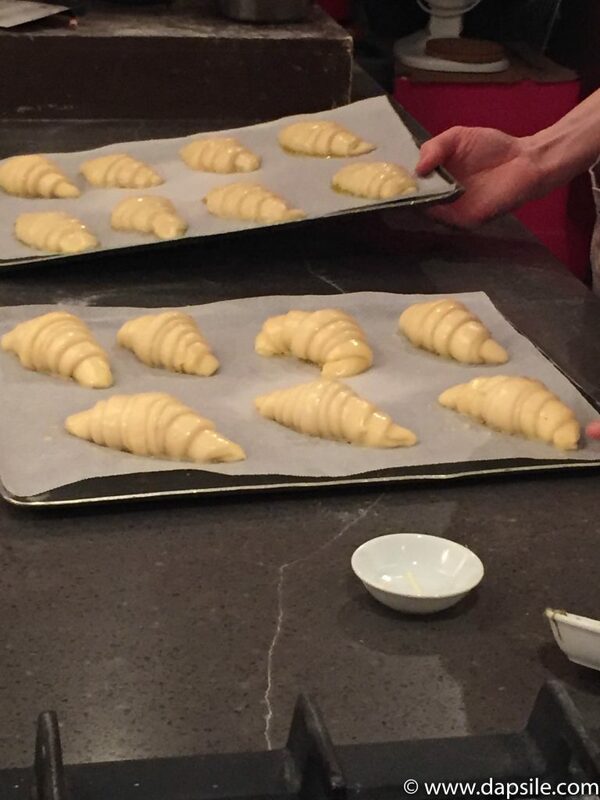 Making croissants can take more than 6 hours so using the other dough, allows for the shorter class time. 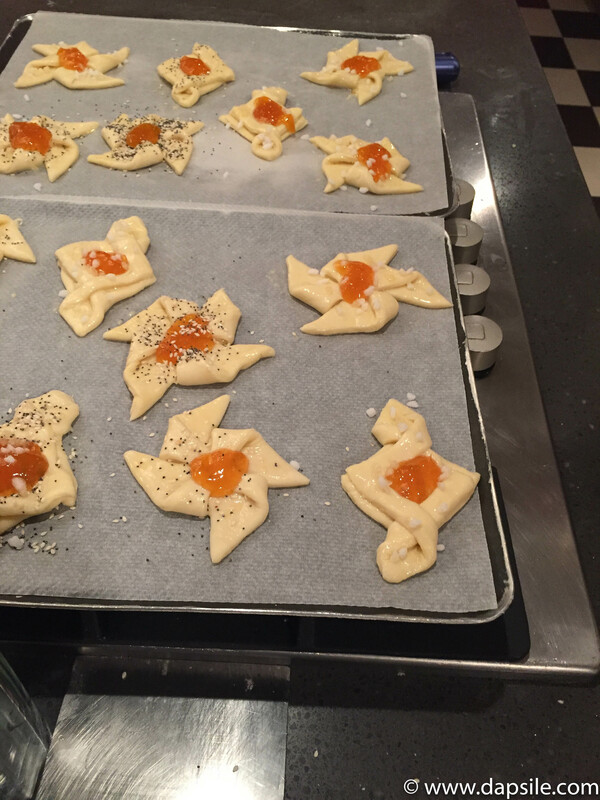 We were even taught how to make the crème patissiere (pastry cream) for the le pain au raisins. After everything is baked, you can enjoy your masterpieces warm out of the oven and even have enough left for breakfast the next morning. We each made two of each of the items. The cost was $99 EURO each but it was such a wonderfully fun experience and I am so happy we decided to do it. Some of the best things to do in Paris that aren’t museums, are the basics. Walking around neighbourhoods. Eating and drinking wine at local eateries. 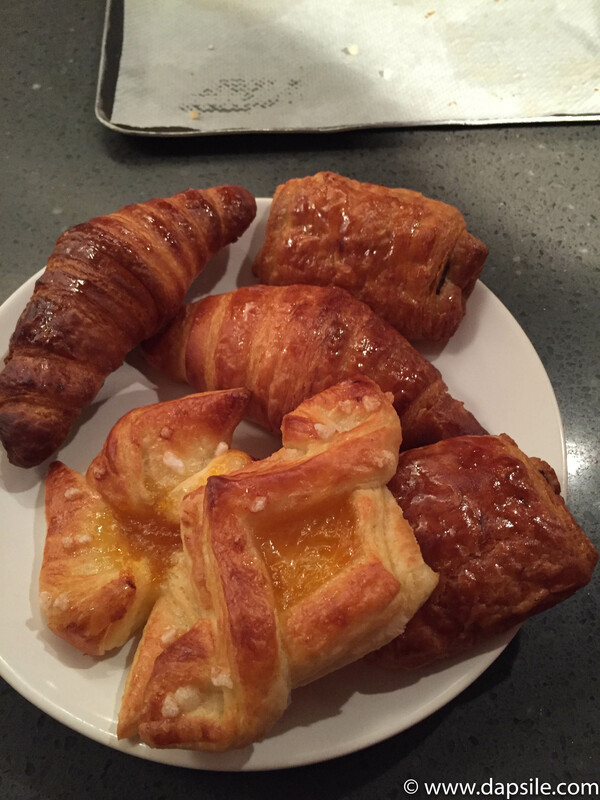 Buying freshly baked croissants for breakfast at the local bakery. And of course, seeing the very touristy sights and monuments. The Eiffel Tower is amazing and I love it. We didn’t get a chance to go up it this time but I can tell you from experience, the view is stunning. It is a wonderful spot to see the entire city of Paris and get a feel of the enormity of it. 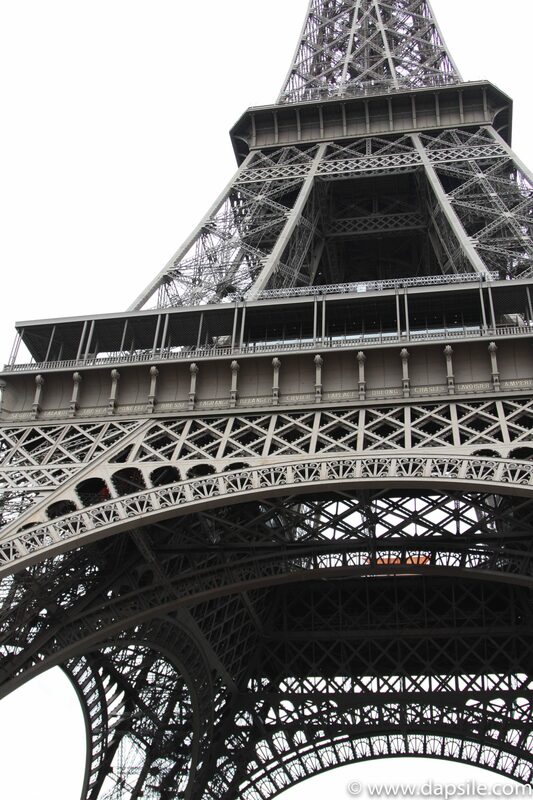 Opened to the public in 1889, the Eiffel Tower has three levels accessible to the public. Things have changed over the years. The lifts (elevators) and the staircases have all been replaced and there have been different uses for the tower itself. There have been a variety of restaurants, a theatre, a small apartment, laboratories, and different communication uses. A new apartment was even built in 2016 for competition winners during the UEFA Euro 2016 football tournament. You can access each level of the tower by both staircase and elevator. The first two levels each contain a restaurant, and the top level observation deck is 276 metres from the ground. Offering you that stunning view. Although the view from each level is also amazing and worth the visit. You can buy your tickets in advance on-line for the Eiffel Tower, saving you one of a possible two lines. Every time I have been there, there are crowds and lines of people. The Champs-Elysees is one of the widest streets I have seen, that wasn’t full of cars. There are cars of course but when you see a road that wide you expect it to either be stuffed or a highway of fast moving vehicles. Even the sidewalks are wide and that’s not including the area taken up by the trees lining them. With its long history dating back to the mid-1600’s, this avenue has seen a lot of changes over the years. 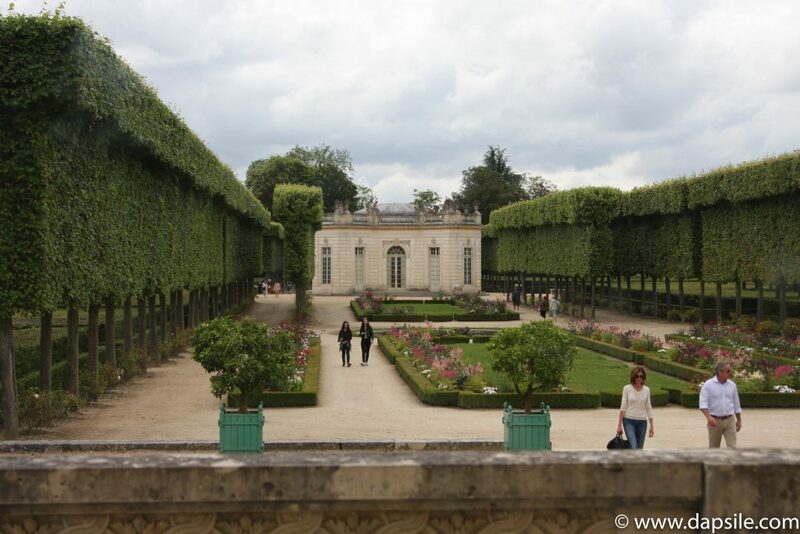 The avenue started out as a garden and wide promenade for one of Louis XIV’s palaces. Today though, while you can still see a park at one end, the Arc de Triomphe is at the other end and there is a whole lot of commercial buildings between them. Most of its commercial history has been for luxury brands but now, you can even shop at some brand name stores along the avenue. There were also luxury cars to rent, restaurants, theatres, and cafes to name a few things. 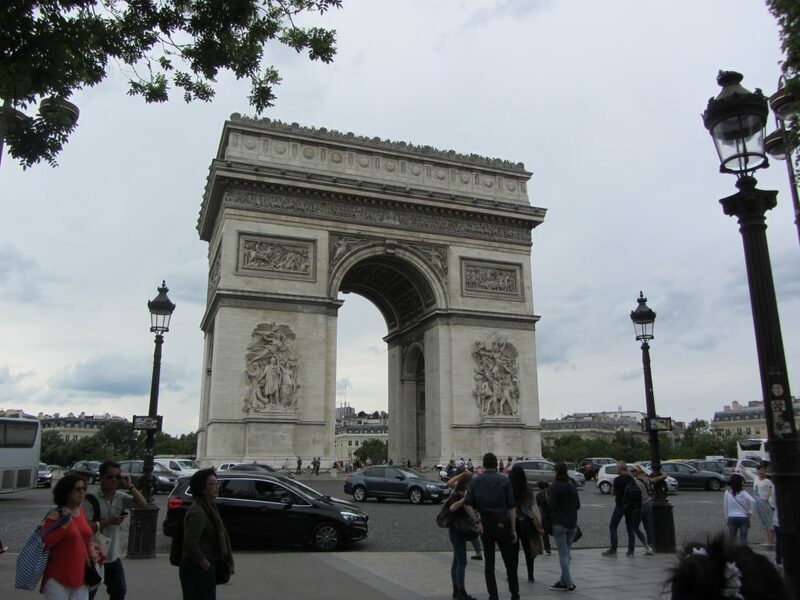 The Arc de Triomphe is a massive, military monument at one end of the Champs-Elysees. Erected to honour the people who fought and died for France during the French Revolutionary and Napoleonic Wars, this monument stands 50 metres high and 45 metres wide with a depth of 22 metres. It is enormous. I’m not a big military history person but I loved seeing this monument for its sheer size. Cars, people and even tour buses look miniature next to it. I wasn’t expecting to be as impressed as I was, standing there watching the vehicles drive around the base of it. Food and sugary delicacies are very enjoyable things to do in Paris that aren’t museums. Located at 75, avenue des Champs-Elysees, Luduree Paris is a sugar lover’s delight. A tea room with an entire shop for macarons and chocolates. Mmmmmm. They had common flavours like vanilla, caramel, lemon, and chocolate but there were also different ones like rose, pistachio, liquorice, and Marie-Antoinette tea. 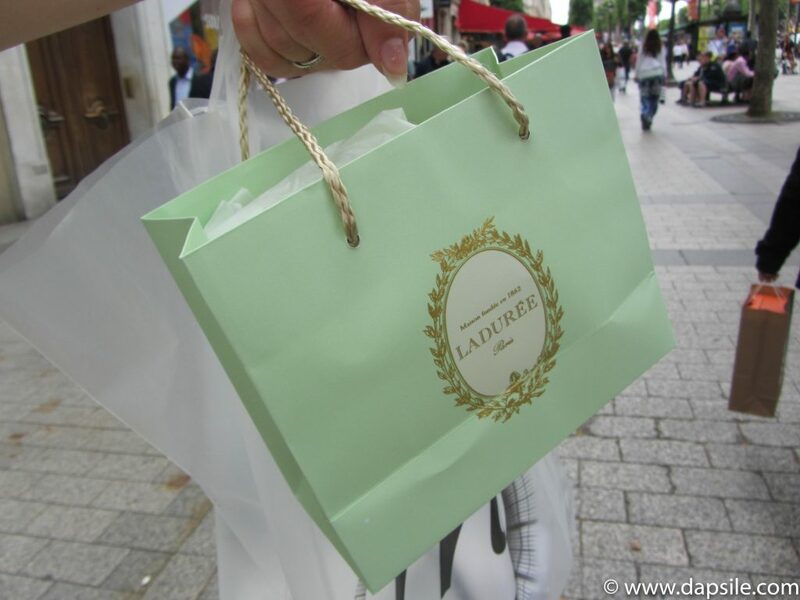 Originally Laduree started out as a bakery in 1862, at 16 rue Royale. The area grew into an elegant district with French luxury items being offered. In 1871, a fire created the opportunity to reopen the bakery as a pastry shop and it soon became a tea room where woman could gather. Something not easy to do outside of the home during that time period. 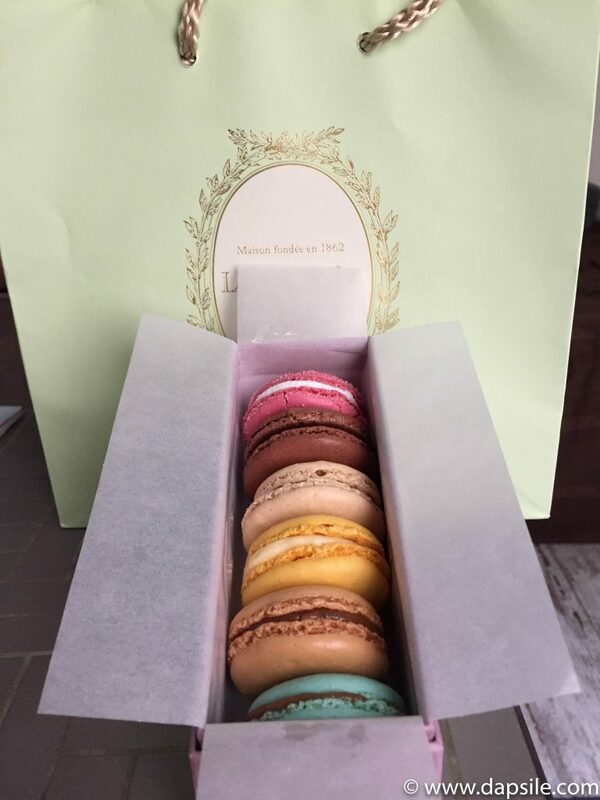 Laduree not only has the above two Paris locations, they also have several international locations to choose from. Since discovering macarons at the Champs-Elysees location, I have satisfied my new-found love of them at both the Vancouver and the Sydney location. There is so much to see in Paris and the surrounding area but we saw everything we did, in 4 ½ days. That included some museums, and things to do in Paris that aren’t museums. You can check out the museums we saw in Paris and read how we found the great deal for the train from Amsterdam to Paris. I like to find deals like this for the basics, it allows me a bit more budget for things like learning how to make croissants in Paris.